The research program addresses crop production challenges specific to the region. These include cultural and management practices for both dryland and irrigated crop production. Specific emphasis is placed on soil fertility and nutrient management, dryland cropping systems (involving crop rotations and tillage practices), and limited irrigation research. The purpose of the research is to increase nutrient- and water-use efficiencies, improve producer profitability, and enhance soil quality and the environment. The station also participates in the statewide crop performance testing program for winter wheat, corn, grain sorghum, and sunflower. Researchers from other locations participate in cooperative research at Tribune involving evaluation of weed control methods and alternative dryland crops. The primary region of focus of the Tribune Unit is the area from Scott City, KS west to Colorado and south of the Smoky Hill River but north of the Arkansas River. The altitude in this region ranges from about 3000 feet to almost 4000 feet. The station also provides service to a larger region since it is located on silt loam soils typical of about 4 million acres in the High Plains in western Kansas, eastern Colorado, and the Oklahoma panhandle. The headquarters consists of 253 acres of non-irrigated land and 7 buildings. There is also an 80 acre irrigated field located 10 miles northeast of Tribune. The land resources are used for field crops research. There is 1 research faculty located at Tribune. Faculty expertise is complemented by 3 full-time technical support staff. Student workers are hired for the summer field season. To learn more, please visit our faculty and staff page. The Tribune Branch of the Kansas Agricultural Experiment Station was established in 1911 on 110 acres 1 mile west of Tribune. The Tribune Branch Station was combined with the Garden City Branch Station in 1986 to form the Southwest Branch Agricultural Experiment Station. 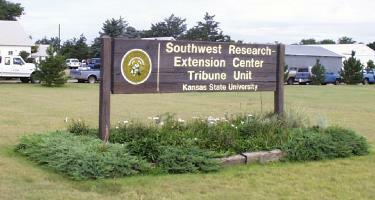 In 1988, the station was given its current name of Southwest Research-Extension Center, Tribune Unit.